The orange wonder you see above is the Chery Alpha 5, a concept sedan that previews the Arrizo 5, an upcoming vehicle that will straddle the gap between the Arrizo 3 and Arrizo 7. It’s actually an evolution of Beijing 2014‘s Concept Alpha, which appeared to have come straight out of the designer’s canvas – at least there’re door handles now! Same five-twin spoke alloys, but everything now looks more ‘productionised’, including the headlamps, tail lamps and front bumper. Pretty well-proportioned, this thing – we like the way the headlamps are attached to the front grille, and the side profile, although not the most original of designs, is easy on the eye. CarNewsChina reports that the production Arrizo 5 will get 126 hp/155 Nm 1.6 litre and 130 hp/212 Nm 1.2 litre turbo engines, plus five-speed manual and CVT gearboxes, when it launches in China later this year. Meanwhile, sitting in a corner is the interestingly-named @ANT3 concept. Never mind that ants don’t have wings; this is Chery’s idea of the future – an “individualised urban public transport system”. Peer into the futuristic interior and you’ll find no steering wheel. Instead, there’s a central joystick which can be used to drive the car or control any of its functions. Intelligent drive with vehicle following system, wireless charging and cloud connection concepts are touted. People move forward the stupid idiot Proton moves backwards. I really wish Proton become extinct and close shop. Proton = Most disgusting worst idiotic junk piece of crap in the world!! The article is about Chery. i think siti is a perodua owner, take it slow gal, play nice. At least we got our own brand instead of other asian country. Honestly, I have long accepted that many Chinese car companies can make good looking cars as of the 2010s. Their strategy is very simple and crude; 1. Hire ex-European car designers. 2. Hire ex-European car engineers. 3. Export to as many countries as possible. It’s a game of who’s got the most cash reserves. Unfortunately, while many Chinese companies today can make good looking and fully-specced cars, few can make refined, well-handling and safe cars consistently. By refined, I mean good NVH, polished interior fit & finish, smooth and fuel efficient engines & transmissions and of course quality & reliability. Nowadays many Chinese cars have become much safer too, but they have yet to reach the tier which involves next generation safety like autonomous braking, lane watch etc. However, they will soon, and they will make well-handling cars too. The only thing that they might take a while to get right is refinement. Even Hyundai-Kia struggled to make a mature, refined car before the 2010s. Proton still hasn’t made a truly refined car, not even the Iriz is truly refined enough (but still very, very good for the money). Anyway, I hope to see Chery introducing their new Arrizo model range here in Malaysia very soon. the more competition we have, the better. Yes you’ll buy Chery but not Proton in Langkawi. Smart choice indeed. A Chinese car is leader (and runner up) in safety: Volvo (and Qoros). Ok ok, serious mode: Yes, refinement makes all the difference. And Chinese cars are catching up fast on this. I dare say their refinement level is already on par with UMW’s Toyota, the shittiest grade of Toyota… in the world (JDM and Europe gets the best). Great Wall M4 is a seriously good alternative to Godcar, in fact it comes with ESP (Auto only, frustratingly), so it’s even better actually. Indeed, we need more competition, so the dealers need to step up for it. Personally, if someone can bring in Great Wall C20R manual, I would love to buy it, provided it is priced right. Chery should follow the like of Scoda & Hyundai. Participate in world class motorsports to prove it’s brand image at world stage. Prove to world their products especially their engine, gearbox, suspension and handling dynamics are on par with top players. Perhaps race in WTCC to compete agaist Honda, Chevy, Citreon & Seat. Another option is to design good vehicles to be used by James Bond, for instance (many ordinary non-car-enthusiast people came to know about AM because of James). The green bee is striking. Seems like China has finally buckled down to the design and innovation of vehicles. He is rising. it looks good. hopefully the safety standard, fuel consumption, handling, realiability and etc are on par with other brands on the same segment as well. Fact. 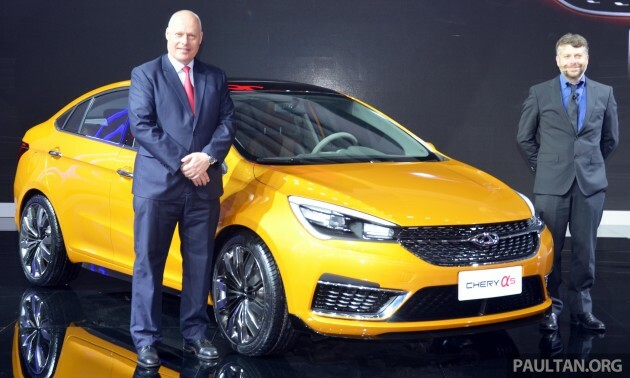 Chery’s vehicle sales have been dropping over the years due to quality issues. Fact. Chery is losing their engineering staffs to other companies. Fact. Qoros’ flagging sales ( less than 6000 Qoros on the road since the first model launched) is attributed to the local perception that Qoros is a Chery (it is a Chery JV company). yeap, chery sales is dropping due to bad quality problem. my friend bought one chery mpv n got hell alot problems especially engine breakdown 2 time after 1 year usinng. now wan to sell, damn low the second value! !, i really pity him. better avoid china car. me too, my chery car toll workshop after using one year due to wiring fault n engine cannot start. air-cond not function also. i complain to chery wrkshp, they said it is normal. What the hell of this type of service is this. regret to buy tis car.